Do you ever have those after dinner sweet cravings? Those nights when you just need a little something? Me too! I was looking through a raw food blog that inspired me and it got me thinking, I wondered if I had anything in my cupboard to make something. I grabbed a bunch of ingredients and my husband asked me what I was planning to make? I replied I don’t know and we laughed.Well my random concoction was delicious!! I don’t really know exactly how much I used of each ingredient but this is as good a guess as any. My recipe for a random after dinner treat. 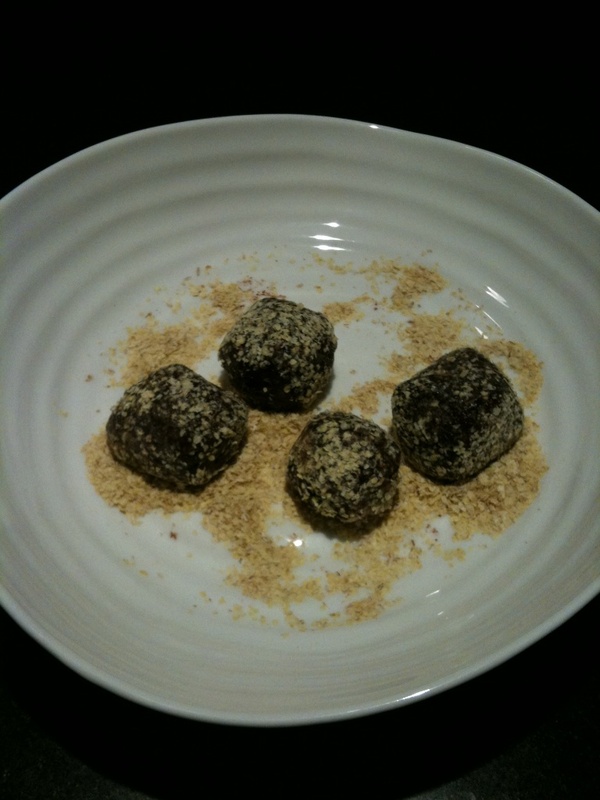 Place almonds, cocoa, agave and wheat germ in a food processor; blend all together, add peanut butter and blend some more, roll into balls and then roll balls in wheat germ, no cooking, no fuss.